North Shore Oahu is a must-see when you are traveling to the island. There are a variety of excursions for you to choose from that range from a stunning helicopter flight to diving with sharks to visiting the Banzai Pipeline where you can watch world class surf boarders take on the biggest waves in the world. If you are adventurous then try a surfing lesson or a standup paddleboarding adventure in a protected cove or ride a dune buggy on roads through the Ko’olau Mountains. The white sand beaches of Sunset and Waimea Bay will thrill all of your senses as you relax and take in the gorgeous tropical scenery of the North Shore area. When you are ready to take that first or seventh surfing lesson of your life, then you need to book a North Shore Surfing Lesson at Haleiwa Beach Park. Your 2-hour North Shore Oahu excursion begins when you arrive at the small town of Haleiwa where you will meet your professional surfing instructor and be outfitted for surfing lesson. Your teacher will decide what stage of lesson is necessary for you and this can range from beginning to expert surfing. Depending on your skill level you will be taught the proper techniques of paddling, standing and carving the waves. Your small-group lesson will take place in a protected cove at Haleiwa Beach Park where you will learn to ride the 1 to 2-foot waves that are gently rolling in from the Pacific Ocean. After you have sufficient time learning you will be set free to try this exciting watersport on your own. When your 2-hour North Shore Surfing Lesson at Haleiwa Beach Park is completed, you will travel back to Haleiwa. 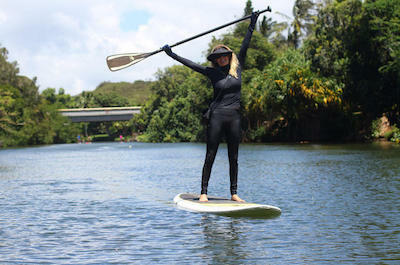 Standup paddleboarding is one of the fastest growing sports on the Hawaiian Islands as well as the world and you can learn from a professional during the North Shore Standup Paddleboard (SUP) Lesson tour. Your 2-hour North Shore Oahu excursion begins when you meet your expert instructor in the small town of Haleiwa which is a short one hour drive from Waikiki. Here you will be outfitted with all the necessary equipment to learn how to SUP. Your excursion will include personalized instruction before you try to SUP on the Anahulu River. The North Shore Standup Paddleboard Lesson tour is great for families and there are a variety of group sizes to choose from which makes for a more personalized learning experience. The protected cove at the Anahulu River is ideal for practicing standing up on your paddleboard and your teacher will show you the correct way to get the most out of each paddling stroke. The serene landscape that surrounds the Anahulu River will help calm your nerves as you learn how to master this fast growing watersport. Your North Shore Standup Paddleboard Lesson tour concludes after a thrilling 2-hour lesson from your expert teacher and your memories as well as skills will last forever. You will be thoroughly pleased with your decision to take the North Shore and Circle Island Adventure which will leave lasting memories in your mind of your trip to Oahu. Your 7-hour North Shore Oahu excursion begins with complimentary hotel pickup service from a select number of Waikiki hotels. You will be transported in a comfortable mini-coach with your tour guide who will have interesting commentary that will enhance your trip around the island. You will first travel over the tropical landscape of the Ko’olau Mountains where your first stop will be the Valley of Temples where you will tour the Byodo-In Temple. From here you will continue to Kahana Bay to watch the wonderful wildlife of Oahu. Going north on your way to Kahuku you will stop at a few shrimp farms and indulge in lunch at one of many Oahu shrimp stands. After lunch you will travel to the white sands of Sunset Beach and watch the surfers carve waves in the famed Banzai Pipeline. Driving along this stunning portion of coastline you will stop at Waimea Bay to watch sea turtles swim before traveling to the laid back town of Haleiwa. As you continue on your North Shore and Circle Island Adventure you will pass through several pineapple fields including a stop at the Dole Pineapple Plantation on your way back to Waikiki. The North Shore and Circle Island Adventure concludes when you are dropped off at one of the selected Waikiki hotels. If you are an aspiring photographer or even a professional then the Oahu Island Photography Tour is the perfect excursion for you. Your 8.5-hour North Shore Oahu adventure begins with complimentary hotel pickup service where you will meet your expert Hawaiian guide who will relay interesting facts about the islands throughout your excursion. Once you are on board the mini-van you will travel to varying destinations that are determined by the time of year you are visiting Oahu. 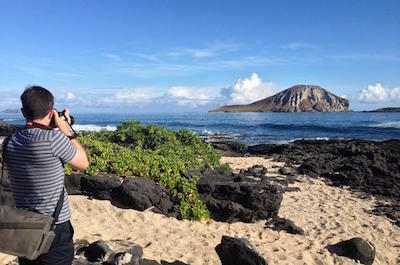 Sights you can photograph include natural wonders like Diamond Head or the Halona Blowhole or even humpback whales swimming in the Pacific Ocean. You will stop at the white sands on Sunset Beach, Waimea Bay and you can shoot photos of the surfers who are challenged by the Banzai Pipeline. You will see waterfalls within the beautiful tropical landscape of the Nu’uahu Valley where you can even take photographs of heiaus or Hawaiian temples. You will have plenty of opportunities and time to take as many photographs as possible at each stop. Your Oahu Island Photography Tour concludes with drop-off service at your Waikiki hotel. The Small-Group Polynesian Cultural Center and North Shore Day Trip is an ideal way for you to learn about the culture and history of Hawaii while exploring the beautiful sights of the North Shore. Your 8.5-hour North Shore Oahu excursion begins with complimentary pickup service from select Waikiki hotels. After meeting your guide you will be transported in a mini-coach to view the gorgeous beaches of the North Shore. 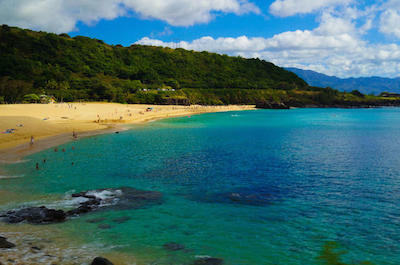 You will travel to Waimea Bay and Sunset Beach as well as catch a glimpse of the Banzai Pipeline. Your next stop will be the Dole Pineapple Plantation which is packed with interpretive signs as well as historic buildings and you can sample freshly picked pineapple. Your adventure continues when you reach La’ie Point which boasts enormous views of the Pacific Ocean as well as the famed Chinaman’s Hat Island. From here you will travel to the Tropical Farms where you will sample fresh macadamia nuts and Hawaiian grown coffee. Now it’s time for lunch where you will eat Polynesian inspired cuisine at the Polynesian Cultural Center. 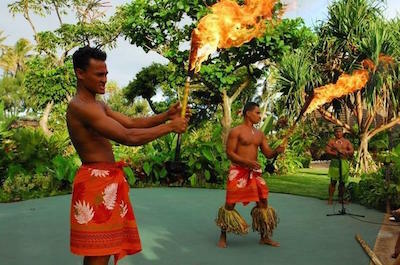 Here you will watch hula and fire dancers, natives making souvenirs and there is plenty of information about the culture as well as history of the Polynesian people. As you drive back towards Waikiki your last stop will be at the fabulous Byodo-In Temple which resembles an ancient Buddhist temple located in Kyoto, Japan. Here you can view koi fish ponds, a giant Buddha and the exquisite architecture of the temple. This North Shore Oahu Day Trip ends with drop-off service at your selected Waikiki hotel. 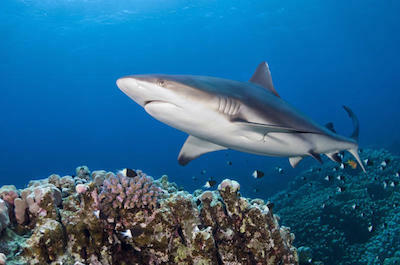 If you like viewing nature in its own natural habitat then you should take the Oahu Shark Dive tour. Your 2-hour North Shore Oahu experience begins when you arrive at Haleiwa Small Boat Harbor where you will meet your captain and qualified boat crew. As you travel 3-miles from shore into the crystal blue waters of the Pacific Ocean you will have the opportunity to watch dolphins, sea turtles and maybe even a humpback whale swim near the boat. When you reach your destination the crew will go over a safety briefing before you enter the shark cage. Once you are outfitted with your snorkel gear you will enter the shark cage and be lowered into the water. In the water you will have sight views of up to 200-feet and will be thrilled at spotting your first Galapagos or Sandbar shark swimming toward the cage. Your adrenaline will reach a new high as the sharks swim around and occasionally charge the cage. After everyone has had an opportunity to enter the cage and view the sharks, your captain will sail back to Haleiwa Small Boat Harbor where your adventure concludes. 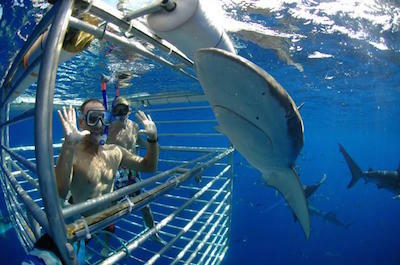 When you want to experience an once-in-a-lifetime event then you seriously need to try Shark Cage Diving in Oahu. Your 2-hour North Shore Oahu adventure begins when you meet the captain and crew of the shark vessel the Kainani in the Haleiwa Small Boat Harbor where you will be transported 3-miles offshore into international waters. Here your expert guides will give you brief safety message about Shark Cage Diving in Oahu before you are submerged into the warm waters of the Pacific Ocean. The large Shark Cage is constructed with big Poly Glass windows for your viewing pleasure and the water at this location is 600-feet deep as well as crystal clear. You will don your snorkeling gear and enter the cage where you will submerge to a comfortable level. Once submerged, you will experience the viewing opportunities of a lifetime as well as extreme adrenaline rushes as the Galapagos and Sandbar sharks swim toward and around the cage. Some of the sharks can reach lengths of 10-feet or more as you watch these magnificent animals in their natural habitat. When everyone in your group has experienced time in the shark diving cage you will be sail home to Haleiwa Small Boat Harbor where your Shark Cage Diving Oahu adventure ends. One of the more adrenaline filled tours which will have you screaming at times is the Zipline Tour on Oahu’s North Shore. This 3-hour North Shore Oahu excursion begins at the CLIMB Works office in the town of Kahuku where you will meet your guide who will explain all the safety techniques needed for your thrilling zipline adventure. After a quick ride on the practice line you will be taken to greater heights and lengths of ziplines on an ATV until you reach the ridge where you will glide down the remaining seven ziplines. 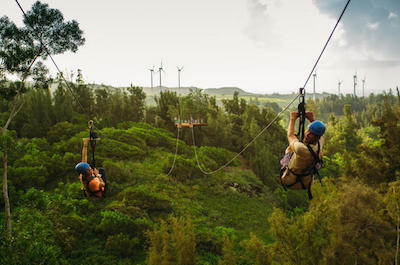 Ziplines range in length from 500-feet to a half-mile as you soar down the mountain side. You will also walk across four different sky bridges and complete two short rappels on your Zipline Tour on Oahu’s North Shore. Don’t worry there will be time for your guide to tell interesting stories of Hawaii as well as time to quench your thirst or eat a fresh papaya. Your fantastic day on your Zipline Tour on Oahu’s North Shore concludes when you return to the CLIMB Works office in Kahuku. 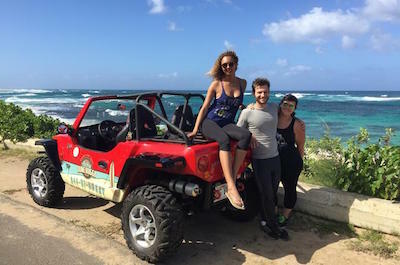 If you want to feel the fresh air rush through your hair while you view the beautiful North Shore of Oahu, then the North Shore Oahu Dune Buggy Driving Full Day Tour is the ideal choice for you. Your 6-hour North Shore Oahu has two departure times throughout the day and begins with either hotel pickup service or when you meet your guide at the small town of Haleiwa. Here you will be given safety and driving instructions on how to use your 5-speed open-air dune buggy. Once you are driving or riding your first stop will be at Laniakea Beach where you will watch the magnificent green sea turtles swim in the Pacific Ocean. Next stop will be at the Waimea Valley, where there is a small additional charge to enter and you will be able to ride on a trolley while viewing the exquisite botanical gardens as well as watch a cascading 45-foot waterfall. From here you head off to Shark’s Cove where you can grab a bite to eat from one of the many island food trucks. After a nice lunch you will drive to Pu’u O Mahuka Heiau and view the sacred temples as well as the breathtaking Waimea Bay. You will continue driving to Kawela Bay and watch the swells of the Pacific Ocean crash onto shore. Your last stop on the North Shore Oahu Dune Buggy Driving Full Day Tour will be at the beautiful white sands of Sunset Beach. Here you will watch surfers take on the challenge of the big waves. Your exciting day adventure concludes when you hop on the shuttle bus which will take you back to your designated Waikiki hotel. 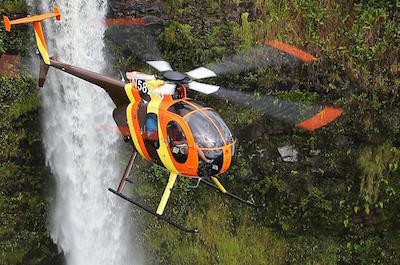 If you want a different vantage point to view the surf break at the Banzai Pipeline, then you need to go on the North Shore Adventure Helicopter Tour. Your 20-minute North Shore Oahu excursion has many departure times throughout the day and begins when you meet your qualified pilot at the Turtle Bay Resort helipad. Your pilot will act as your tour guide when you are flying and relay interesting facts about the history as well as the culture of the Hawaiian Islands. Once you are on board a 4-passenger helicopter you will feel your adrenaline lift to new levels as you take-off. After you are flying in the air your first sightseeing opportunity from above will be the bays of Kahana and Waimea where you can gaze downward on the huge waves breaking at the Banzai Pipeline. From here you will travel to Sunset Beach and watch the white sands sparkle in the sunlight before you head off to the Ko’olau Mountains for a breathtaking view of the beautiful tropical landscape. Your last sightseeing opportunity on the North Shore Adventure Helicopter Tour is a spectacular view from above of the famous 1,000-foot waterfall named Sacred Falls. Your excursion ends when you land back at the helipad at Turtle Bay Resort. When you are ready to learn the most exciting watersport on Oahu, then you need to take the Private North Shore Surfing Tour from Waikiki. Your 7 to 8-hour North Shore Oahu tour begins with complimentary pickup service from your Waikiki hotel where you will be transported to the North Shore. Your qualified guide will tell you interesting stories of Hawaiian folklore and facts as you travel to the famed surfing waters of the North Shore. You will have a chance on this private North Shore surfing tour from Waikiki to explore many different places on Oahu before you reach your final destination. Once at the North Shore you will be given private surfing lessons so that you can master the waves at Waimea and Sunset Beach or perhaps even carve the Banzai Pipeline, depending on your skill level. Other activities you can enjoy on this excursion are snorkeling and swimming as well as taking photographs of all the beautiful sightseeing locations you will stop at while you travel in a 4x4 vehicle. Your Private North Shore Surfing Lesson Tour from Waikiki concludes with drop-off service at your Waikiki hotel. If you have always wanted to learn to surf, then you need to learn from a qualified professional while taking the Surfing Lesson on the North Shore Oahu tour. Your 2-hour North Shore Oahu excursion has many different departure times throughout the day and begins when you meet your expert surfing teacher in the quaint town of Haleiwa. Here you will be given instructions on how to use your surf board before entering the water of the Pacific Ocean. Once you are in the water and comfortable on your board, your instructor will give you expert tips on how to carve the waves. 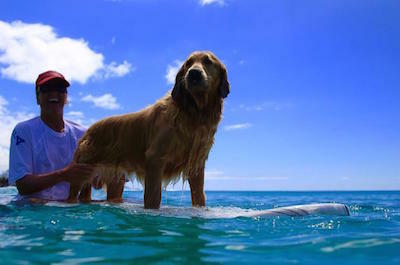 The waves will be small which makes the Surfing Lesson on the North Shore Oahu an excellent excursion for beginners, children and the whole family. An added bonus to this wonderful learning experience is the additional marine life you will encounter like sea turtles. 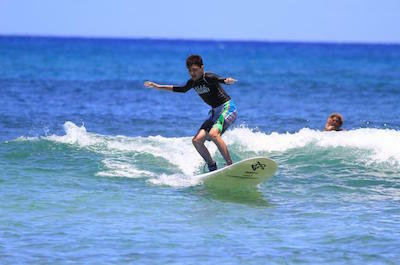 The surfing Lesson on the North Shore Oahu makes for a great day in sun and on the water as you learn a new sport.